A Southern Grace: back with a bang? Meh, it's more like I'm back with a gentle rat-a-tat. I had hoped to return to you with an inspired and supremely superior food creation, but alas, you'll just have to settle for one of the most peculiar, interesting, and yes, delicious dishes I've had in quite some time. *Can we say adjective abuse? I think so. In a medium saucepan, warm 3 tablespoons of the olive oil over medium heat. Add the couscous and cook until toasted and lightly browned, stirring often, about 5 minutes. Carefully add the stock and half of the lemon juice, and bring to a boil. Reduce the heat and simmer, covered, until the couscous is tender, but still firm to the bite, stirring occasionally, about 8 to 10 minutes. Drain the couscous. In a large bowl, toss the cooked couscous with the remaining olive oil, remaining lemon juice, zest, salt, and pepper and let cool. Once the couscous is room temperature, add the remaining components. Toss to combine and serve. It indeed does look pretty and I love the combination you chose! I am going to ask all the hot men I know to say cous cous now.. thanks for the tip. A healthy couscous with much flavor! So now I'm looking in the mirror, watching myself say "cous cous." It's too earlly in the morning! This does look good, and different from my typical recipe. I'm loving the mix of fruity and savory these days. Thanks for sharing! Hello Grace! So glad to have you back :) I love cous-cous, just had some for dinner, but mine was definitely very boring compared to your be-jewelled creation. Yum! Marvelous flavors in your couscous, Grace! And unusual. I'm glad you're back Grace! And you're back with a beauty of a dish -- love the nectarine for a hint of sweetness in there! 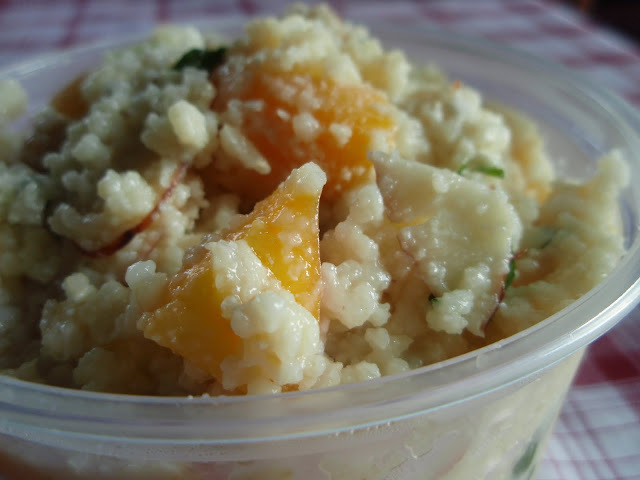 A wonderful combination of ingredients in this couscous! Especially love the addition of nectarines! Hi Grace! I've missed you! That is a stunner of a dish...love all of the colors. I love couscous dishes, especially when they include feta and chickpeas. Never would've thought about adding nectarines, but it sounds like it works. Looks like a lot of fun! I reckon nectarines pack a fair bit of bang! I want to eat this right now! 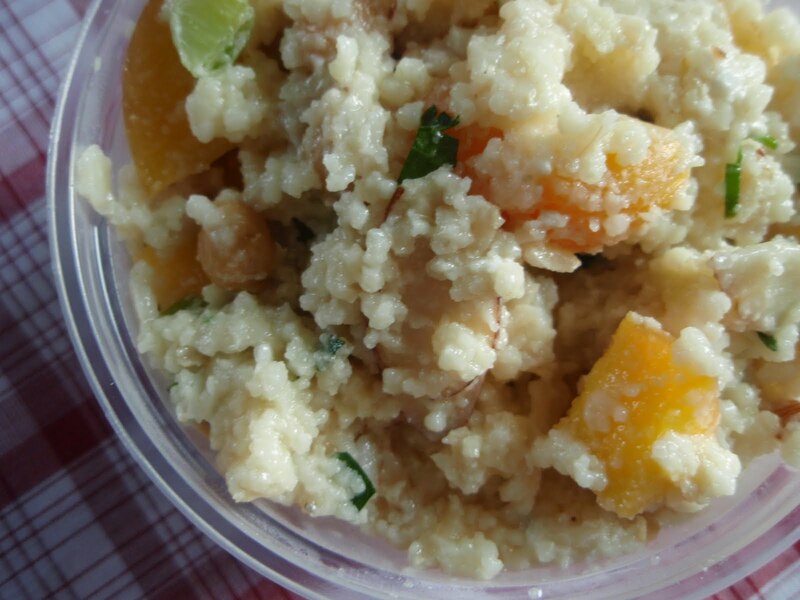 I love the added almonds & feta cheese in this couscous salad!! That must make it extra special,...mmmmmmmmmmm,...lovely food, Grace! That is such an interesting take on cous cous! Peculiar? I guess I need to look into the dictionary....maybe peculiar means delicious and comforting? Que platito más interesante y más liviano, esto tiene que estar delicioso. What a yummy way to jazz up couscous!!! What a unique combo of ingredients for this couscous dish! And welcome back...with a bang or a rat-a-tat, we'll take you either way! I'm so happy. I've been looking for ways to jazz up cous cous! yummy! i just made some cous cous the other night with golden raisins and pine nuts, but this recipe really adds a lot! and a lot of my favorite things! i will try it for sure, thanks! That looks absolutely yummy, I am starving! I have to say, I think this combination of ingredients sounds incredibly complex and yet amazing! The perfect mix of sweet, salty, tangy, delicious. I think that looks awesome! I made some recently with dried peaches from the farmers market, along with green onion, and it was yummy with chicken legs! Looks yummy. I need to tuck the recipe away for next summer when the nectarines are in season. What an intriguing combination of flavors! It sounds really yummy- I love nectarines anyway, and together with all of this other deliciousness I know they'd be fabulous. Glad you're back! I have been really into Israeli cous cous lately. This looks awesome Grace and welcome back! Yes it's different, but it looks amazing Grace. I love nectarines, so I imagine they are the star of this dish. I've had trouble finding good ones this year. I've bookmarked this to try. Thanks! Glad your back, missed ya, and this looks wonderful, I've never heard of a creamy couscous before. I love the salty, crunchy, sweet combination you have going on in this dish. YUM! I love how colorful it is. wow, very interesting use of couscous! reminds me of rice pudding. You can make the same old meats all the time, but great side dishes really make the meal. I love sweet and savory dishes like this. A must-try. And welcome back! I'm actually on a bit of an unplanned hiatus myself but hope to be back soon, too. You are always challenging me... I would never have thought of this, not in a million years! I've never been big on nectarines either but this combo has me quite intrigued. My guys think they don't like couscous, but I don't even think they know what it is. I may have to give this one a try! Oh Lord, I haven't had couscous in such a long time. Looks and sounds fantastic Grace! Wonderfully intriguing mix of flavors... YUM! I make a salad very similar to this. Sometimes I even add a little curry powder to the broth to cook the couscous. Makes for a super easy and very flavorful dish. Love the flavors in this one! Oh my so many great flavors here, and colors. This would make a great lunchbox treat for me and my hubbster. Thanks! I love all these flavours in the couscous! I love the flavor combination you choose, this really looks amazing. This is very new for me Grace ,I love the idea of all those flavors together! Adjective abuse? I think not. They need to earn their pay, just like the other parts of a sentence. The salad looks like it's definitely worthy of a try. Would you be very cross, though, if I left out the feta? It is indeed a pretty dish! The apricots are a perfect addition. Cous-cous is part of our regular diet here at home. I really like the flavors and it brings cous-cous to a new level. I like it! I cant think of any grain that can bring so much satisfaction with so little effort or time; hurray fro couscous! Great sweet salty combo in this cous cous & by the way now I will STARE at anyone that says this word to see how funny they look. Come to think of it I will say it over & over again in the mirror ;) xo Glad you are back, we missed you! What an interesting and different recipe!! This looks great! I love the sweet element with the added nectarines. Now this looks quite interesting! I'm intrigued and would love to try it! This looks extremely delicious! Great flavor combination. Love it when healthy dishes are sweet and savory! This looks like a satisfying meal. Mouth is watering, for sure :). wow what an interesting combination of flavors! i never would have put them together but it sounds delicious!